How one Georgia school district brought salad bars to all their schools. School Nutrition Director Wimberly Brackett knew that if she could place salad bars in all Dalton Public Schools, both kids and staff would eat more whole, fresh foods. She was also confident that she could lead her food managers and the Dalton, GA community through the transition successfully. And she was right! 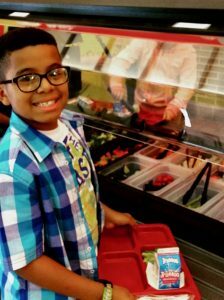 Students and staff love the salad bars and are excited about the opportunity to eat more fruits and vegetables every day. 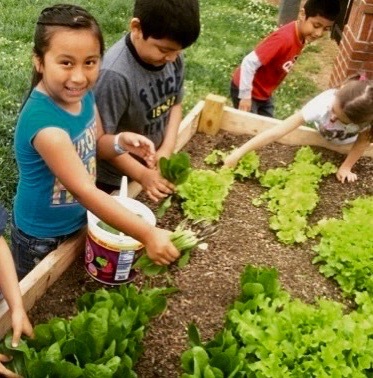 Director Brackett attributes her success to starting small, building on existing school garden programming, and strong communications with staff and parents. Director Brackett started with two salad bars in schools with established learning garden programs. Students in these schools looked forward to seeing fruits and vegetables from their gardens in the salad bar and staff were already accustomed to the prep work required to stock the salad bar each day. With gardens that could supply the fresh harvest, staff working successfully to stock the salad bar, and students and staff happily eating from the salad bar, Director Brackett turned to Salad Bars to Schools to supply salad bars for all Dalton Schools. In other schools in the district, staff were a little more nervous about the introduction of salad bars to their cafeterias. Director Brackett helped shift attitudes and remove any manager’s fears about changing work routines by sharing success stories and menus from other schools. After understanding what worked well elsewhere, the managers were able to share Director Brackett’s vision for salad bars in all Dalton Schools. Director Brackett also garnered support from parents by being transparent with her communications about the process of bringing salad bars to schools. She explained any anticipated changes through email newsletters and other school communications. Additionally, Director Brackett regularly posts on Instagram so parents can stay up to date on cafeteria happenings. Once the salad bars were in place and the new lunch menus were up and running, response from students, staff, and parents was very positive in all nine Dalton Schools. Students continue to be excited about the salad bars and look forward to hearing which salad bar offerings were harvested from school gardens. They also race to the cafeteria to be first in line at the salad bar, and more staff members are eating from the salad bar! Being willing to take the time to connect with parents and listen to their stories was another important part of Director Brackett’s communications. Parents recognized the benefits of the salad bars immediately and shared their children’s positive experiences and new attitudes towards fruits and vegetables with Director Brackett. For some children, the salad bars are their only source of fresh produce. For others, salad bars expanded their personal tastes. “I had many parents come to me and share stories of how their children started ordering salads when they go out for dinner or how their children used to not eat any fresh foods, but the salad bar gives them so many choices and helps them develop a taste for fresh fruits and vegetables,” said Director Brackett. With a proven track record of salad bar success, Director Brackett and Dalton Public Schools are looking forward to more salad bars in their new school sites. The school district is expanding and salad bars continue to be a priority for the district. We think it is a great priority and cannot wait to continue working with Director Brackett to get more salad bars in Dalton Public Schools!